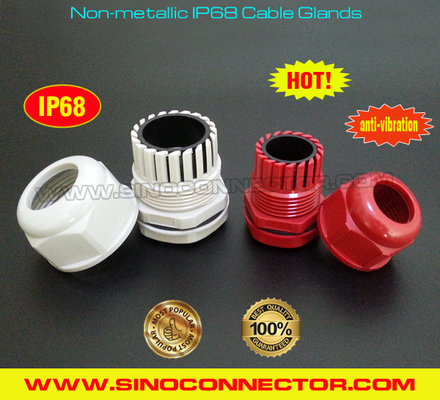 IP68 Rated Non-metallic (Plastic / Nylon) Cable Gland with Anti-vibration Lock. IP68 Rated Non-metallic (Plastic / Nylon) Cable Gland with Anti-vibration Lock has the features of wide clamping range, high stress and strain relief, waterproof function & anti-vibration mechanism, they are widely applied for connecting and sealing cables or wires to provide effecitve protection against dust, water, oil, weak acid, alkaline, alcohol, solvents in the fields of electrical and electronic technologies, machineries, telecommunications, wireless networking ODUs, power supplies, switches, motors, distribution boxes, solar PV modules, Inverters, lightings, displays, traffics, signals, surveillance cameras, plant engineerings, installations, meters and instruments, etc. (1) Direct factory who sell products at factory prices. (7) Different cable glands can be customized as per customer's request. (8) OEM services can be provided. 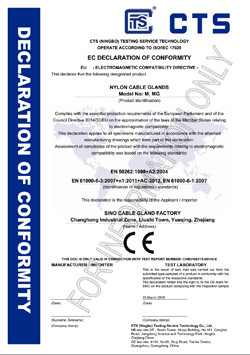 We are one of the most professional manufacturer of Cable Glands & Cable Accessories in China. 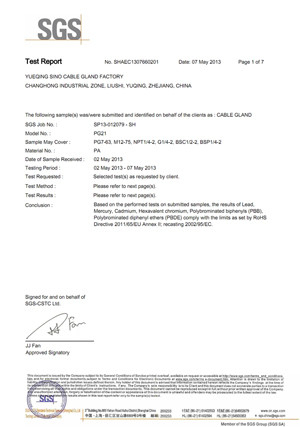 Currently we manufacture and export Nylon Cable Glands & Metal Cable Glands with PG, Metric, NPT, G, BSC & BSP Threads. With high quality, reasonable prices and good services, our products have been exported to more than 100 countries and regions. Welcome customers from home and abroad to work with us! !